Generally, there is a lack of housing convenient to transit and services such as shopping and daycare. 17.Q. Each local community should plan for and encourage higher density housing near commercial centers, transit routes, and parks in both existing neighborhoods and new development areas. 17.Q.1 . Local governments should encourage mixed-use, walkable and transit-friendly development near centers of activity such as transit stops and neighborhood business centers. 17.Q.2. Local governments should identify residential neighborhoods that lack convenient access to services and encourage the development of shopping and services to support these neighborhoods through planning, zoning and private partnerships. 17.Q.3 Local governments’ comprehensive plans, zoning codes and development regulations should accommodate mixed use development, where appropriate. 17.Q.4. 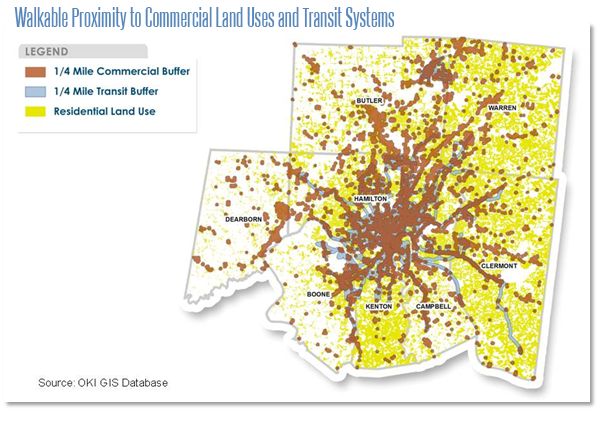 Local governments should work with transit providers to identify areas where planned higher density housing and employment would create a demand for additional or new transit service. 17.Q.5 . OKI’s long-range transportation plan prioritization process will continue to acknowledge transit needs identified by local comprehensive plans and transit providers.